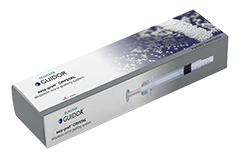 GUIDOR easy-graft is a mouldable, sticky biomaterial that can be applied directly from the syringe. When in contact with blood, GUIDOR easy-graft hardens within minutes to form a porous scaffold that perfectly fits the defect morphology thus providing excellent clot stability in the initial healing period. 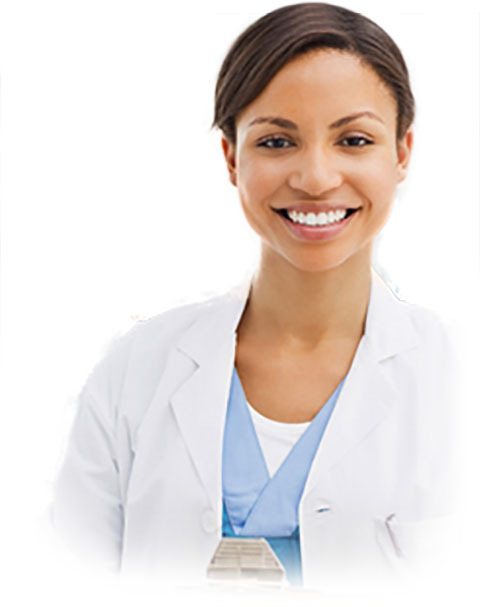 More details about GUIDOR easy-graft? ...the use of synthetic (alloplastic) materials would result in lower surgical risks and lower morbidity in augmentation procedures and would represent an important step forward in simplifying bone regeneration techniques." With GUIDOR easy-graft and its stunning handling and technical features such forward thinking considerations become reality. 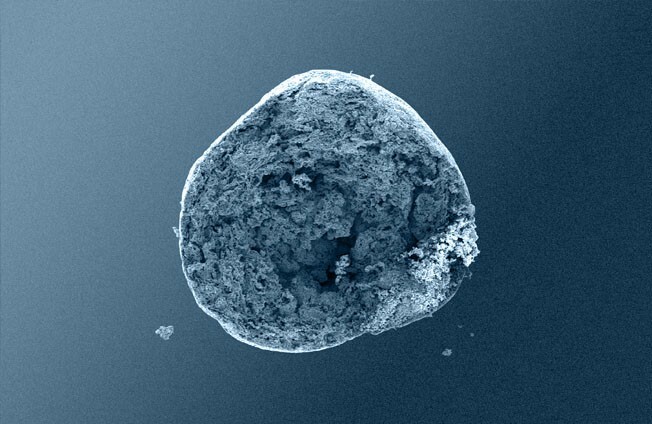 1: GUIDOR easy-graft system contains a pre-filled syringe of polymer coated granules (coloured blue in the illustration and labeled B in the scanning SEM image in the 'Granule Porosity' section below) together with a separate ampoule of polymer activator (BioLinker, as shown by dots in images 1). 2: When added to the syringe, BioLinker softens the polymer coating creating a sticky surface. 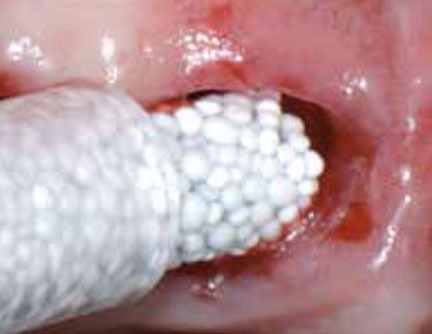 GUIDOR easy-graft granules stick together when compressed and shaped. 3: When in contact with body fluids (highlighted in pink) BioLinker is flushed out of the material. 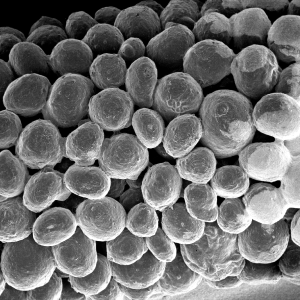 4: GUIDOR easy-graft hardens in a matter of minutes, forming a stable porous scaffold of interconnected granules matched to the defect shape (see also 'Macroporosity' SEM image below). Osteoconductive bone grafts must stabilize the site, support a clot and provide space for new bone formation. The stable scaffold created after application of GUIDOR easy-graft material stabilizes the site. 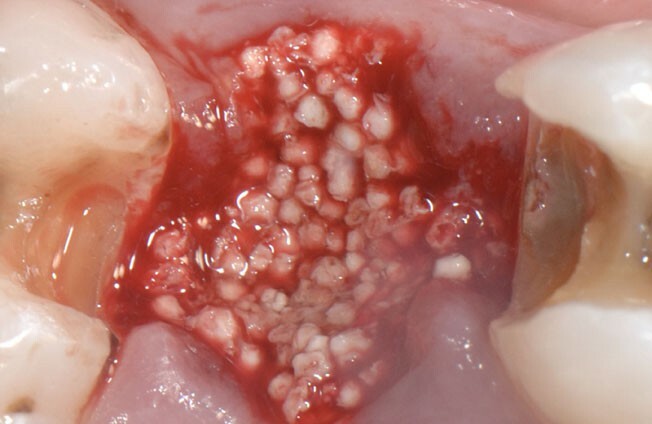 The space between the adjoined granules supports a clot and allows space for development of subsequent new vessels. Microporous calcium phosphates with pore sizes 1 μm to 10 μm provide increased osteoconductivity and bone formation in comparison with materials without micropores. An open micropore system allows for optimal fluid circulation. 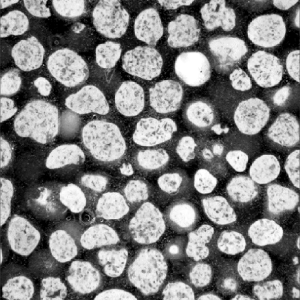 The high microporosity of GUIDOR easy-graft is visible under the scanning electron microscope (A). More than 90% of BioLinker is removed from the bone graft substitute within three hours (1) and excreted through the urine within 1–3 days (2). BioLinker contains NMP, a solvent widely used in pharmaceutical and medical devices such as dental membranes, subcutaneous drug-release systems etc. 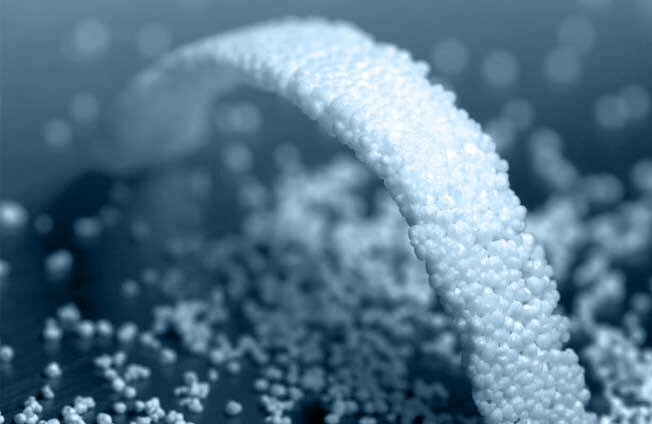 In parallel to the healing and regeneration process, the PLGA coating and adhesive connection between the granules gradually weakens (three to six weeks in vitro). The resorption process of PLGA is controlled by a hydrolytic cleavage of the polymer chains. Upon complete degradation, lactic acid and glycolic acid are formed. Both metabolites are innocuous, and they are excreted in the form of carbon dioxide and water. 1. Habibovic P., Sees T. M., van den Doel M. A., van Blitterswijk C. A. and de Groot K.: Osteoinduction by biomaterials – physicochemical and structural influences J Biomed Mater Res A ( 2006 ) 77( 4 ): 747-62. Over 90% of surveyed clinicians reported that they are “very satisfied", or “satisfied” with the handling, wound healing and bone regeneration of GUIDOR easy-graft (1). 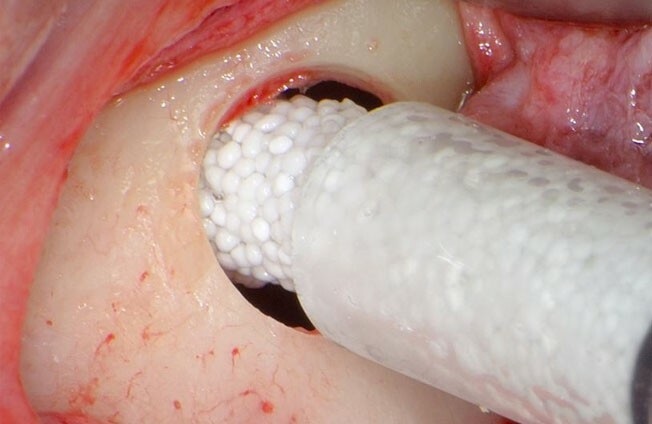 The unique mouldable (syringe delivered) technology and in-situ hardening features of GUIDOR easy-graft create a perfect analogue scaffold within the site. GUIDOR easy-graft does not require a dental membrane for stabilisation in most cases (for specific indications - see local IFU). 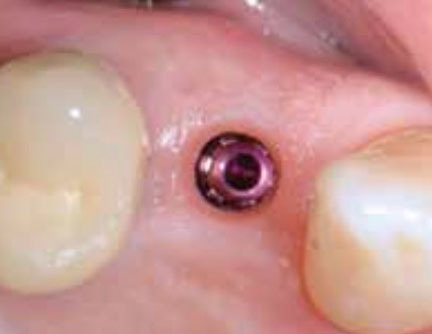 This key feature makes it ideal for minimally invasive procedures, ridge preservation and cases of peri-implant grafting where significant defects are not identified. 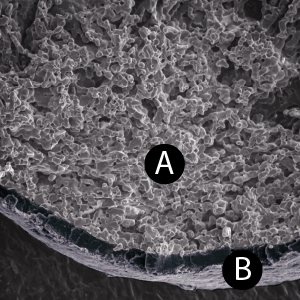 The in-situ hardening and mouldable application can be useful adjuncts when combined with alternative bone graft or membranes in advanced sinus lift and ridge augmentations. Post Extraction Alveolar Ridge Preservation, Scientific Background, Minimally Invasive Treatment Protocols and Expert Reports using Alloplastic Biomaterials. 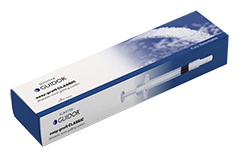 Each GUIDOR easy-graft system contains one pre-filled syringe of coated granules and one ampule of BioLinker activator.